Although winter in Iceland can be the most challenging time of the year, it is also one of the most magical to experience! Today we would love to share with you some local knowledge on visiting Iceland in December, during the Christmastime holidays, and insight into seeing Northern Lights! So what makes this time in Iceland so freaking magical? The Aurora Borealis (AKA, the Northern Lights)! Thousands of tourists flock to Iceland to experience the incredible natural phenomena of the Northern Lights. It truly is one of the most spectacular sights in the world to see the Northern Lights dance in the sky (like no joke they do!)! The color seen most frequently is green, but if strong enough the lights can also pink, purple, orange, white, even yellow and a mix of all. The Aurora Borealis is likely the most unpredictable natural occurring wonder on the planet because a lot has to align in order to see them. In example, things like the sun has to emit solar flares, needs to be a clear night (no cloud cover), it’s best to be outside of city limits and away from light pollution, and you need to be in the Nordic countries typically between November-March (best chances). More information on the science specifics can be found here on Space.com. 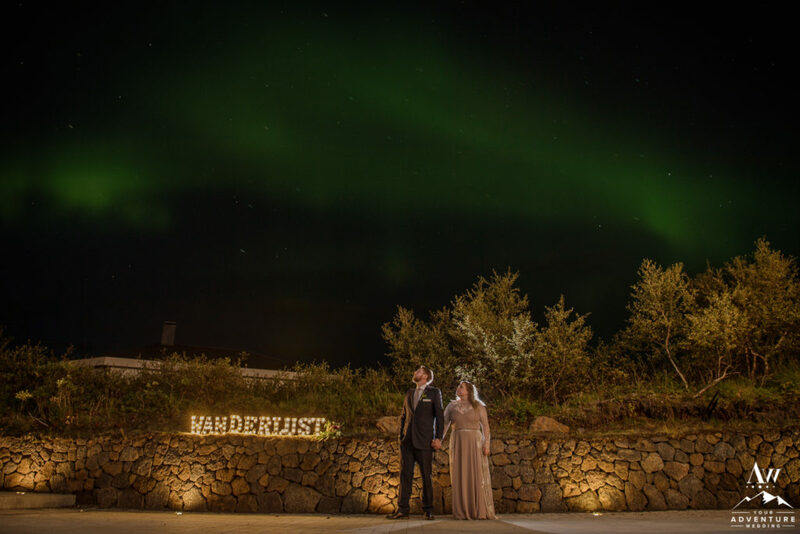 We get daily Iceland Wedding Planner inquiries during this time of year from people coming to Iceland wanting to plan a surprise proposal underneath the Northern Lights or are hoping to get married and have Northern Lights as their wedding photo background. Although it is a dreamy idea, that is often where it ends because again the conditions have to be right. If you’re set on proposing or getting married under the Northern Lights in Iceland, I would highly suggest you plan at least a 7-10 days and have your group / vendors be “on call” each night waiting for the opportunity. A fantastic site that can help you plan the likelihood of seeing them (only 1-2 days before) is Vedur. The website provides an outlook of cloud cover throughout Iceland and rates the chances of seeing each day by a 1-9 scale. The earliest we have personally witnessed Northern Lights is between 9:30-10pm and the latest we have seen them come out is around 3-4am. Oh la la, seeing downtown Reykjavik and walking through the streets is one of the most warming feelings I have ever experienced. You’ll find the streets fully decorated and lit-up. A pop up ice skating rink can also be found near the city square to add to the ambiance (don’t worry you can rent skates, buy snacks and beer too!). There are folks caroling as you shop and even a postbox to the North Pole where you can drop off your letter to Santa (year round) at Litla Jólabúðin. Several Christmas trees are donated from around the world and displayed as well. Fun Tip: Ask a local about the trees and pick your favorite one! Other cute things to do during Christmastime in Reykjavik is stroll around Tjörnin (the local pond where ducks and geese hang out) and shop on the famous Laugavegur Street! Special Note: HERE is a fantastic resource to look at when needing to know opening hours of places during December in Reykjavik. The Icelandic Christmas traditions begin at the end of November, as that is when folks begin decorating the outside of their homes (to brighten spirits of the daylight being less everyday until December 21st). It likely that before Christmas you will also find your way to delighting in a traditional Christmas Buffet. I experienced my first one this year and thought it was a pretty unique experience. Because there are so many items in it, I’ll link you to one of menus, HERE. Did you know Iceland doesn’t just have one Santa, but 13 mischievous ones? They are called the Icelandic Yule Lads. They are pranksters with silly names like ‘Sausage Swiper,’ ‘Window Peeper,’ ‘Bowl Licker,’ ‘Door Slammer’ and even ‘Candle Beggar.’ Beginning on December 12th, a Yule Lad comes down from the mountains each day (they each have their own day, see HERE) and leaves children a gift or a punishment in their shoes (that they leave by the window). They are small gifts, usually things like a clothing item, candy, etc and if the child has been bad that year than a punishment is left like a rotting potato. There’s a catch… Each Yule Lad is on a mission for his mother “Grýla” who wants to make any of the bad children into a stew. After everyone has exchanged gifts on the 24th night and going into the 25th, the famed Christmas Cat (or Yule Cat) comes around and will EAT anyone who has not gotten a clothing item for Christmas. Um, yeah this sounds like a fantastic scary Christmas movie in the making, right?! Families will gather together to make Laufabrauð (leaf bread). Often there are competitions between family members on the best design. Want to bring an Icelandic tradition into your own home before your Iceland wedding? Checkout the recipe, HERE. Traditionally they put smoked lamb on top and east alongside their holiday meals. Þorláksmessa is a holiday celebrated on December 23rd in honor of Saint Þorlákur the patron saint of Iceland. This is also when Icelanders finish their Christmas shopping, decorating the Christmas tree and typically delight in a traditional delicacy: Fermented Skate. I kindly advise you to immediately wash your clothes after eating it (or burn them). It’s one of the most pungent smells I have ever encountered. Those who are game to party, can join in the “Ugly Sweater” Bar Crawl that happens in downtown Reykjavik each year typically from 10pm-2am. Christmas Eve is the day that all Icelanders celebrate Christmas with their families. Traditionally everyone dresses up and sits down for a delicious meal together at 6pm. The food that is usually served varies by family… Many serve smoked leg of lamb (hangikjöt), Ptarmigan (a gamey bird) smoked ham, and younger families may serve turkey (adapting from American traditions). After dinner, presents are opened together as a family. Christmas day is a lower key day that is spent visiting the extended family you did not spend Christmas Eve with. Then some of the older generations may spend it reading books (they received for Christmas) in bed, drinking coffee, and munching on leftovers (smoked lamb and leaf bread). Others may spend together relaxing, playing games, eating, or binge watching movies. 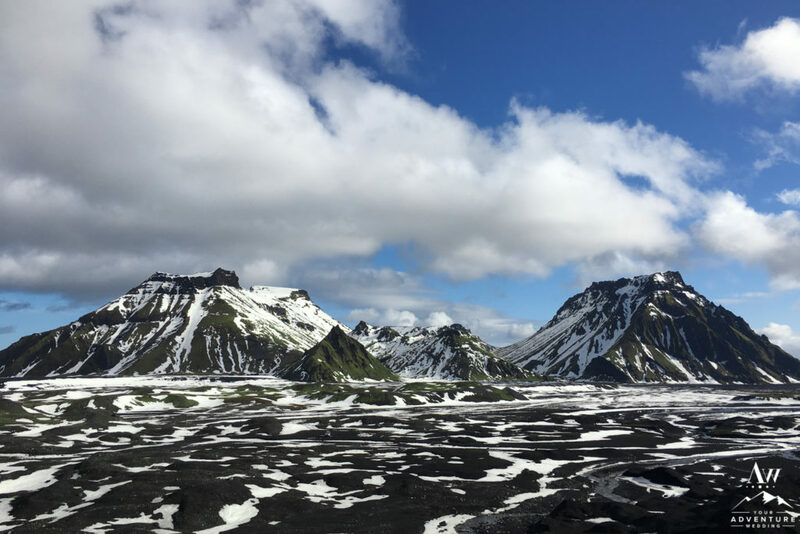 This day in Iceland can be tough if you’re a tourist because there are more things closed than open, so plan ahead by taking a look at the “opening hours” of places HERE. I would dare to say that New Years Eve is the biggest party night of the entire year in Iceland. Why? Mainly because it is only legal to set off fireworks during the week between Christmas and New Years (with the climax being NYE). Anywhere you go in the entire country will have a view of fireworks (even in the countryside!) at some point! It’s like all day, no joke folks! Many folks like to go up to the hill the Perlan sit on to view where others stay in the heart of the city and see fireworks behind Hallgrímskirkja. Icelanders say “goodbye” to Christmas by burning it off. By going to big bonfires where people dress up as elves, trolls, and party. © 2017, Photos by Miss Ann / Your Adventure Wedding, All Rights Reserved.